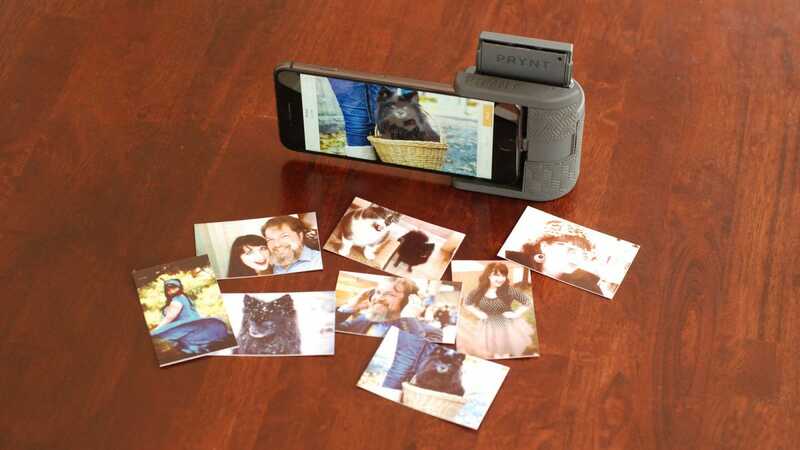 If you’re looking for a fun photo accessory for your iPhone that brings back the feel of an instant camera with a modern twist, the Prynt Pocket is a retro-themed gadget that puts a photo printer right in the palm of your hand. There’s been a resurgence in instant photo film (with a digital twist) in the last few years on the account of two big factors. First, there’s the technology to do so: Zink photo paper (a portmanteau of “zero ink”) is a full color thermal printing paper that allows for a single pass zero-ink print process. This gives companies like Prynt, Polaroid, and HP a platform to incorporate photo printers into digital cameras, phone cases, and phone accessories. Second, there’s a certain nostalgia for physical prints. In an age when we can all snap tons of photos but rarely take the time to print them off to frame or stick on the fridge, there’s a definite novelty and allure to a simple little device that can turn our digital snapshots into instantly delivered little physical snapshots. That’s where the Prynt Pocket comes in. 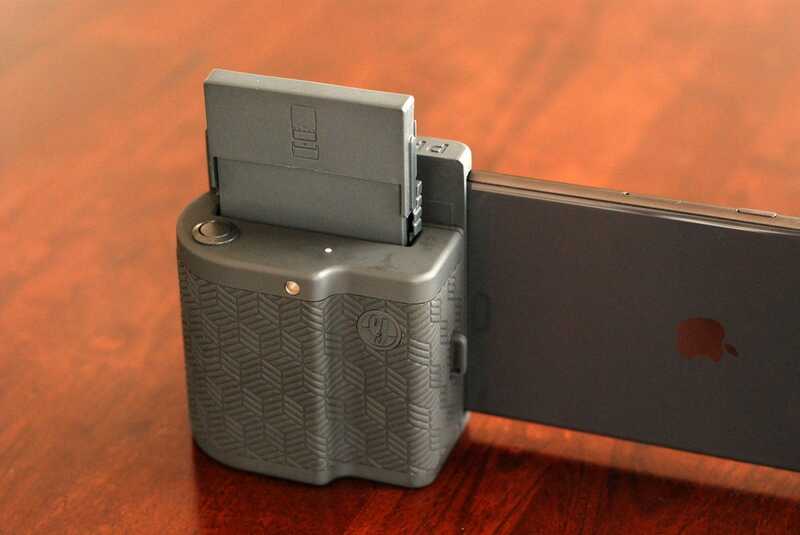 It’s a $149.99 iPhone accessory that has the form factor of a chunky retro camera hand grip but houses a Zink printer and, coupled with the free Prynt app and packs of special paper, turns your iPhone into an instant camera. So is it worth it? 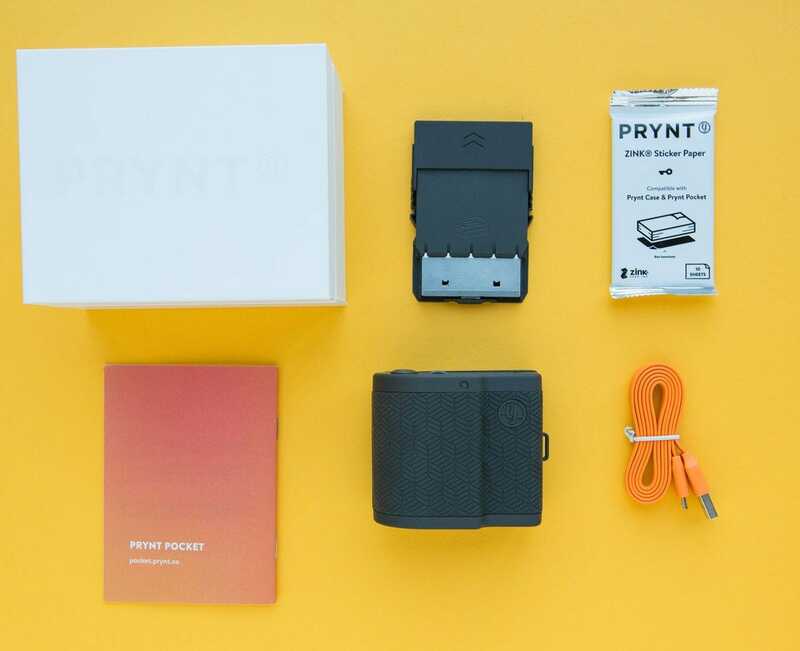 Let’s take a tour of the product and all its features to see if the Prynt platform is a good fit for you. The design of the Prynt Instant is either one you’re going to love or hate, but if you’re even entertaining the notion of adding instant photo printing to your phone, it’s probably one you’re going to love. 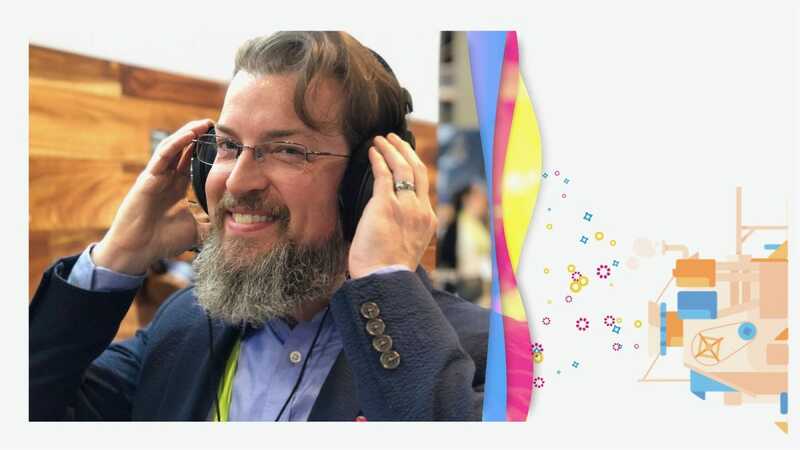 We liked the design and when we field tested the Prynt with our kids, spouses, and neighbors they all loved it too. The design is simple: you remove your iPhone from its case (if it has a thick case, really slender cases like the official Apple leather cases might work without removal), open the sliding clamp mechanism, press your phone onto the lighting connector in the Prynt, squeeze the sliding body closed, and open the packet of Zink Prynt paper and pop it in the little print tray, seen below, and you’re in business. You control the whole thing with the Prynt app (which we’ll touch more on in a moment). Once the whole thing is assembled you just hold it like you’d hold a camera with the grip in your right hand. There’s a button on top of grip, styled after a physical camera button, and you can snap away. When you choose to print your snaps, they pop out of the printer (processing, printing, and all) in under 10 seconds. Let’s be honest, the app is usually where companies (especially small companies like Prynt) usually screw things up. We were pleasantly surprised with the Prynt app. Not only is the app perfectly functional for the process of taking the photos (you don’t have to take the photos on the spot, by the way, you can use any photos stored on your iPhone including those you took before you even bought the Prynt system) but it handles a host of extra functions well too. A cute on-screen animation “eats” your photo as it is physically printed out. In addition to basic photo editing and printing your photos, it also stores the prints you’ve made (so any edits to the prints are preserved) and has a pretty novel live video function. How do you get video out of a printed photo? If you create a photo with Prynt and make it a live photo (like you can do with your regular iPhone camera) your friends can look at the photo with the Prynt app and the photos come alive, Harry Potter style. It’s really something you have to see to appreciate (even if it’s not a feature you’re interested in it’s still pretty neat) so check out the official promo video below to see it in action. Gimmicky or not, it works just like it appears here. In addition to the core functionality of the Prynt app there’s a really great extra feature built right in: you can order extra paper and related gear right from within the app. Given that the time you most want to remember to order more paper for a photo printer is when you’re using it and it’s running low on paper, it’s a great design choice to put simple reordering right in the app. Speaking of simple reordering, one of Prynt’s big selling points is that they have a all-you-can-print subscription model: $35 every 2 months and as soon as you’re down to 10 sheets left in your 40 pack of paper, they send you a new box at no cost (shipping included). 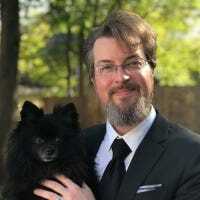 We were, admittedly, pretty skeptical about this process working well (or at all for that matter) but we signed up for a trial and dutifully tested it. Sure enough the app notified us when were low and reordering was a one touch affair. More paper arrived a few days later. If you’re curious how the math works out on the subscription plan, here’s a good way to look at it. If you (or the person you’re buying the camera printer for) will take more than 40 snap shots a month then it’s a good deal. A 40 pack of paper costs $20 so even if you’re only using a pack a month the $35 subscription saves you $5. If you’re taking more than that (and some of the teenagers we let play around with the camera would easily rip through more than a pack a month without blinking) then you’ll definitely come out ahead. So we’ve looked at the build of the device, the software (and features) you pair with it, and talked about the general product, but one thing we haven’t talked about yet is the physical prints and print quality. First and foremost, we’re super impressed with the prints. They’re 2×3 inches with a peel and stick back (if you wish to use them as stickers, if not the back stays firmly on) and pretty good color reproduction in light of the sheer limitations of packing in a zero-ink printer into a deck-of-cards size space. Are they as perfect and sharp as a 5×7 photo printed by a quality machine in a professional photo lab? Absolutely not. In our tests of the printer we found the colors were often a little under saturated and if you printed a bunch of pictures in a row the printer tended to print a little lighter than usual. Those aren’t problems specifically with the Prynt printer, however, but just something to take into consideration with the whole Zink system. The Zink system is really why the whole thing is so great though. 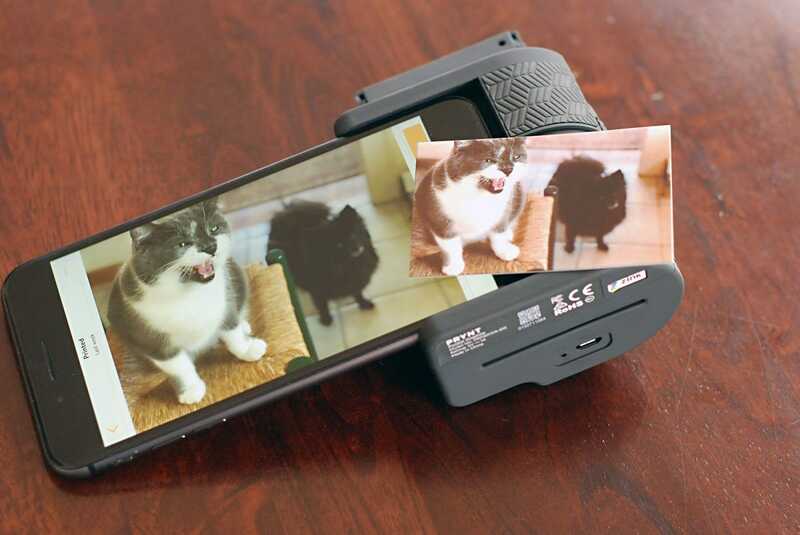 You’re getting instant photos, within seconds, on demand, with no ink, no cartridges, no fussing, and reloading the thing is as easy and putting paper in a printer tray. In light of that and in light of the fun it is to use, we’ll absolutely forgive a tiny bit of softness and a little imperfect color reproduction. So with all the factors laid out—what it is, what it costs, and what it produces in the end—is it worth it? If you’re looking for a fun product that combines a retro vibe with instant “film” that pops out on demand, it’s tough to beat.